Freelove was a founding member of the critically acclaimed band Two Nice Girls, formed by Gretchen Phillips, Kathy Korniloff and Laurie Freelove. After releasing their debut on Rough Trade Records, Laurie decided to leave the band and set out to forge a solo career. She was 'discovered' by Nigel Grainge of Chrysalis/Ensign Records at a music conference in Austin, Texas. Recognizing her potential as a break-through artist, she was signed to the English label within the week, and that year recorded her first solo CD 'Smells like truth'. 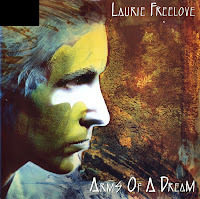 'Arms of a dream' was the first single taken from the album, but the single did not chart.